The direction of the unexpected. 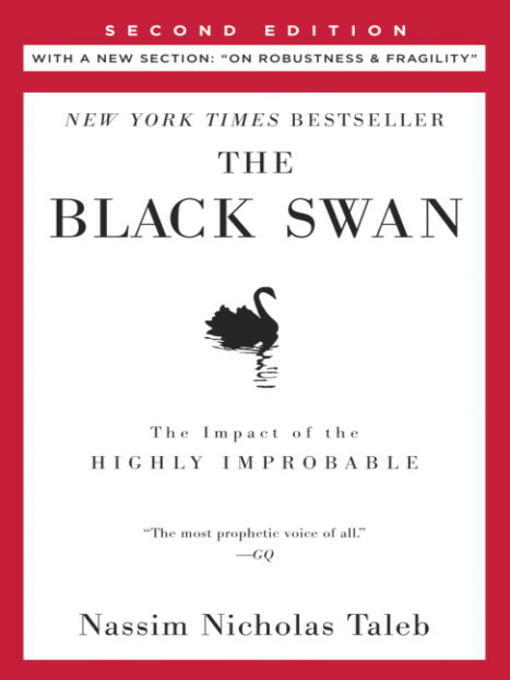 I am currently reading The Black Swan by Nassim Taleb, which had been recommended to me so often in the last four years that for a while I became irrationally opposed to reading it. But after two quarters of intense study of predictive analytics and econometrics, this seemed to be a good antidote. There's lots to say about this book, and I'll never fit it all into one post. But let me pass along this succinct bit of planning wisdom I read tonight: "The unexpected almost always pushes in a single direction: higher costs and longer time to completion." I've written about this idea before, and we've probably all experienced it. The bill at Costco is always larger than you think it is going to be; it takes twenty minutes longer to find a parking spot than you anticipate. And in the case of fundraising, a program always takes longer to get off the ground than you hope it will. Sadly, the counter-measure is not a tighter timeline and fewer resources. It makes sense to plan for things to be a bit more expensive than you'd like them to be. Because, they will be. Lies, damned lies, and huge Excel reports. I was in a meeting the other day trying to figure out a particularly thorny issue. We had a group of smart, experienced, opinionated people in the room -- my kind of meeting. About halfway through the meeting, one of the participants produced a huge, multi-page Excel print-out. Many of the pages had colored graphs, three or four to a page. A second set of pages contained an assortment of tables correlating variables against one another. An accompanying narrative outlined that there was a "significant" relationship between some of the variables because the correlation coefficient was over .5. "As you can clearly see from this graph..."
We all kind of sifted through the print-outs and gave them the old college try while the presenter tried to narrate. After a few minutes, it was clear that none of us, including the presenter, understood what the graphs meant. There was no description of the units or explanation of how they were derived. And so what happened was everyone started to use the graphs to explain their own point of view: "What I think they mean is..."
It was humorous, really, and luckily we all noticed it and started laughing and threw the spreadsheets aside. At the same time, the experience was a good reminder of how easy it is to manipulate -- and be manipulated by -- numbers. Label graphs clearly for your audience, not for yourself. Provide notes if the graphs aren't clear -- but if the graphs aren't clear, rethink whether to use them at all. Be careful of comparing correlations of a huge number of interconnected variables. In many systems (datasets), the variables are correlated with each other -- that might be why you are studying them in the first place. So comparing a correlation of .5 to a correlation of .6 and calling the latter "better" is more than a tad sloppy and isn't the whole story by a long shot. Variables interact. To study the interaction of a number of variables, look to regression analysis instead. And most of all, this hopefully (?) goes without saying, but don't base decisions on a report that no one can understand! My head is still bursting from last week's excellent Run-Walk-Ride Fundraising Council Conference. This year the conference was more vibrant than ever. One reason was that this year's gathering was the largest ever; more people mean more opinions, more interaction, and more overall passion. I think there was something else, though -- as economic conditions slowly improve, I get the sense that nonprofits are ready to get moving again. It has been a slow few years, and there's a healthy impatience in the air. Event 360's Suzanne Mooney has written a nice recap of the conference on our blog. And as usual, we've published a fantastic infographic of this year's results; the astute reader will note some interesting trends as compared to last year. For my part, I was grateful for my annual opportunity to address the entire conference. This year I pulled back from my usual tactical advice and outlined a larger imperative I see: The imperative to start swinging for the fences again. After five years of playing it safe, it is hard to see the continued benefit of conservatism. Our most powerful advocates, like the most powerful ideas, are on the fringes -- and so playing to the averages isn't going to get it done. I have a chance at this year's NTEN Conference to expand on this theme in a lot more detail, and I'm looking forward to doing just that at the somewhat-awkward time slot of 1:30 p.m. on Saturday, April 13. I hope to see you there. An appeal to the world at large: Please stop sending me the link to this year's TED presentations. Yes, I've seen it. Yes, I know who it is. It has been a rewarding and busy quarter for me. Already this year I've had quite a number of intense, immersive meetings with our nonprofit clients. Growth has been the central theme of every meeting. There's optimism in the air again, and groups are looking out of the bunker window-slit to try to decide what to do next. Our engagements include a review of current growth forecasts (along with, eventually, a heavy bit of re-engineering of those forecasts). When I pull up an organization's spreadsheet, I almost always see that some number -- 4%, 8%, 12% -- has been added to last year's results as "baseline growth." When I ask where that number came from, I invariably hear that it came from the C-suite. The more frustrated staff will roll their eyes; the ones plucky enough to play along will say, "Our normal expectation is growth." I've had this experience a number of times this year. This will sound a bit harsh for a Friday, so bear with me: The normal state of things is not growth. It is decline. My skin will not get better as I age; my 401K will not automatically double every five years; my Betamax video recorder will not be cutting edge technology indefinitely. Even worse, it is very possible to take things all the way to zero. It happens quite often, actually. Remember Bear Stearns? Palm? Hostess? Blockbuster? Small errors can create massive problems. Small issues can mushroom into monumental failures. My house could end up being worth less than my mortgage. We've all lived through a massive, five-year economic example that demolition is quicker and more definitive than construction. And yet I fear we may have missed the lesson. The natural state of your program is decay. This is especially true in fundraising, where participant and donor retention might be 30% or less. In other words, we need to replenish 70% or more of our constituents just to stay even. Making no changes to your fundraising program -- or worse, pulling funds and staff from it -- will speed the deterioration. This is a great time for fundraising because as the economy picks up the results of the entire sector will pick up. But please don't let that convince you that you can put things on autopilot. "Organic growth" is seldom organic and almost never comes from just riding a wave. Growth comes from hustle, ongoing investment, and constant innovation. When I hear nonprofits say they are going to "take a conservative growth strategy" I get a nervous twinge, because it is usually code for "we're going to wait and hope." Waiting and hoping is not conservative -- it is incredibly risky, because it will almost certainly accelerate your decline. And it is a patently irresponsible strategy. It's time to get out of the bunker. Investment is your most sensible approach. If you're game, I'm going to bravely take on this topic – and a few others – in thirty minutes or less at next week's Run-Walk-Ride Fundraising Conference. I hope to see you there.